Well we are clearly into the rainy season in the Pacific Northwest. What I had been able to trail run just a few days earlier was nearly impassible on this day. Small trickling streams crossing the trail were transformed into raging, waist deep, scary, fast moving flows. Here’s a photo from the same place with much less water. This is another one of those places in the Columbia River Gorge that makes it so amazing. 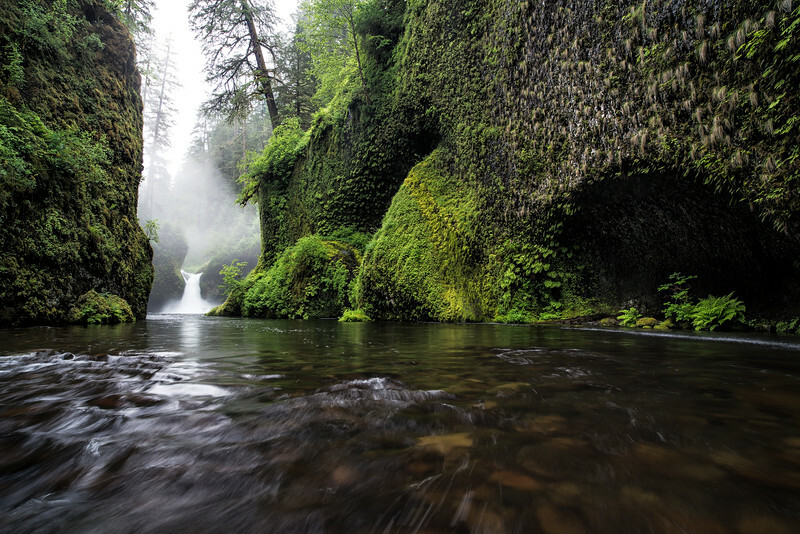 Punchbowl Falls is just an easy couple mile hike in from the trailhead. The falls come spilling out into this “bowl” which is flanked by these really neat granite walls covered with ferns, moss, etc. At times, it can be quite busy here by not many people walk out into the water (cold most of the year) or if you just wait a bit, eventually you’ll have a people free moment to get a nice photo. There are several waterfalls along this trail and if you keep going, about mile 6 is a 250ft waterfall with a tunnel going right behind it halfway to the top!